the Big World Blog: Is Norway killer Anders Breivik mad? Is Norway killer Anders Breivik mad? On the twenty second of July 2011, Anders Behring Breivik detonated a car bomb in the centre of Oslo that killed 8 people. The Police had no idea what or who they were dealing with and considered the threat so great that they wanted to get people off the streets as quickly as possible by any means allowed to them. This gave Breivik the means to commit more murder later that day. The chief of police Einar Aas said, "We hadn't a clue who or what we were dealing with or the underlying motive,"
"That's why we wanted to get people off the streets and away from public places. We had to avoid more people being injured or killed." Two hours later Breivik went on a shooting rampage, choosing a political summer camp on the island of Utoeya. This time he casually executed another 69 innocent people. When the first reports of shootings on the island of Utoeya came in Norway's specialist anti terrorist commandos were sent to the scene. But their rescue attempt was held up allowing Breivik to continue unhindered. There was no helicopter available for the commandos so they had to make a 25mile road trip through mountain roads adding an extra 40 minutes to their arrival and to make matters worse the team had to fill the one available police boat. The crowded boat started to take on water and eventually stopped. They were rescued by a local boatman and when they finally reached the island Anders Breivik surrendered. 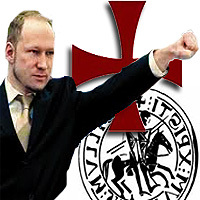 Breivik claimed he had targeted the Labour Party because it promoted multiculturalism a policy that he believed was bringing about a Muslim takeover of Norway and Europe. 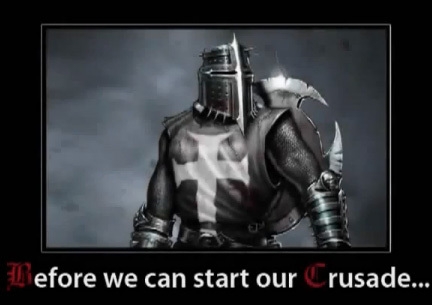 He also claims to be a member of a right wing group he calls "the knights templar" This is the same secret sect often mentioned in conspiracy theories and featured in popular books such as the Holy Blood and the Holy Grail. Although there is historical evidence for such a group Breiviks manifesto claims they are still operating. Breivik is now in court and although no one seriously believes he is innocent the question centres around his sanity. If he is considered insane he will end up in a mental institution if not he will serve his term in Prison. "Not an organisation in a conventional sense". The group consisted of "independent cells, and therefore in the long term will be a leaderless organisation". The "big problem" for militant nationalists in Europe was that they had had very few role models since World War II. He answered many questions - particularly about his alleged meetings in London - with a "no comment". At one point during the hearing the prosecutor asked why he was smiling? "Because you're asking me questions you know I'm not going to answer,"
The prosecution showed the court an excerpt from Breivik's 1,500-page manifesto. He wrote that he underwent a "complete screening and background check" for the Knights Templar to ensure that he was of "the desired calibre". He claimed the group was considering "several hundred" individuals throughout Europe for a training course. The court does not believe that he did form links with such people. They're trying to discover whether he's a fantasist. "The view that Muslims should leave Norway has nothing to do with psychosis," she says. "The belief that Muslims will take control of Europe within 20 years is shared by many people without them being psychotic." Many Norwegians will feel relieved at the conclusion because of a widespread belief that Breivik should be held to account for his crimes by being sent to prison, and not to a psychiatric institution. If Breivik is judged sane and found guilty of murder, he faces a maximum of 21 years in jail, although that sentence can be extended if a prisoner is deemed a threat to the public. If he is judged to be insane, he will be committed to a psychiatric institution.